I was suppose to go into work today to do some designing on a rush project but the day was just too pretty even if it was a bit brisk. Instead, I went for a nice long drive through the snow covered woods listening to Celtic Crush, sipping my coffee, just going where ever the road took me. While wandering the far back roads, I found an open winter farm stand selling the best vegetables of the winter and late fall crops. I'll bet you would shift the Savory Mashed Turnips planned to accompany the Tuscan Pork Chop on tonight's menu to Wednesday too! Instead we're having roasted root vegetables along with a sneak peak at Mark Bittman's How to Cook Everything . adapted from "How to Cook Everything"
Wash and scrub the vegetables. 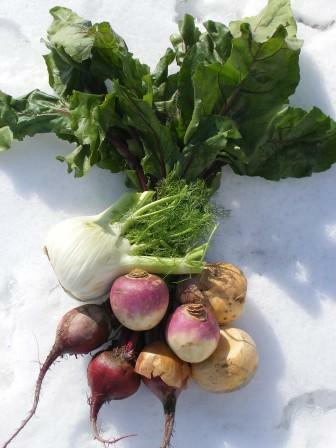 Peel the rutabaga, turnips and beets (where latex gloves with beets to prevent turning your hands red. Cut all the root vegetables to chunks of equal size. I like 2 - 3" chunks and set aside. 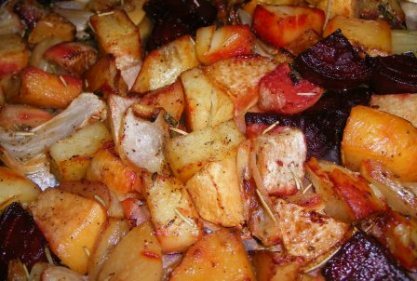 Line a large roasting pan or the bottom of a broiling pan with heavy duty foil (Not necessary but makes for easy clean up, especially with the beets). Coat with 3 Tbsp of olive oil. Evenly distribute vegetables only (hold back garlic, it will be added later) and drizzle with remaining olive oil. Season with Kosher salt, pepper,thyme, rosemary and sage (if using). Stir vegetables around the pan, turning over the vegetables until all are coated with seasoned oil. Bake for 30 minutes, stirring the vegetables occasionally until vegetables begin to brown. Add garlic and continue to cook vegetables, stirring the vegetables about once every 10 - 15 minutes until they are fork tender. If vegetables start to over brown before they soften, add a few tablespoons of water and turn down the heat to about 375 and cover loosely with foil. Once vegetables start to soften, remove foil and allow to finish cooking. Note: Depending on the type of vegetables, this roasting may take up to 1 hour to 1 1/2 hours. But Wait! That's Not All! !